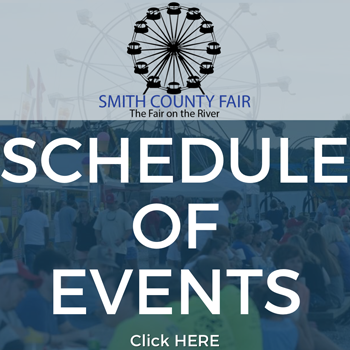 The Smith Count Fair Meat Goat Show will take place at the Smith County Ag Center at 5:30 p.m. on Friday, July 6, 2018. Weigh-in time will be from 3:00 p.m. to 5:00 p.m.
Pee Wee Showmanship classes will begin at 5:30 p.m. Weight classes will begin immediately flowing the Pee Wee Showmanship class. The entry deadline is Friday, June 29, 2018. There will be an entry fee of $1 per goat. All animals must have current Health Certificates at weigh-in. All classes will be shown by weights. There is no minimum weight. There will be four divisions of goats shown: Market kids (Market kids is for wethers or doe kids raised for slaughter. All animals must have their kid teeth to show in this division), Doe kids, Yearling does and Senior does. Each division will select a champion. Each exhibitor will be allowed seven (7) animals, five for the regular show (these five (5) are to include: Market kids, doe kids and yearling does.) We are also having an extra division and the exhibitor will be allowed: (2) Sr. does for the show. Wether kids and doe kids must have all milk teeth at weigh-in. Wether kids not having them will be dismissed and does without both milk teeth will be moved to the yearling doe division. Yearling does are allowed to have no more than two sets of adult teeth (4 large teeth) to be eligible to show for champion. Those having five or more large teeth will be shown as Sr. does. All goats must be polled or have their horns either tipped or cushioned with a material to help prevent injury to the exhibitor. All goats must have legible tattoo or ear tag in order to show. All goats will be weighed and classified prior to the show and will be divided into classes in their divisions. Show management reserves the right to disqualify any animal that exhibits any sign of disease regardless. Smith County Fair Association, volunteers or affiliates are not responsible for any accidents. Saw dust will be provided for bedding. If you would like to use your own bedding, please use pine shavings. 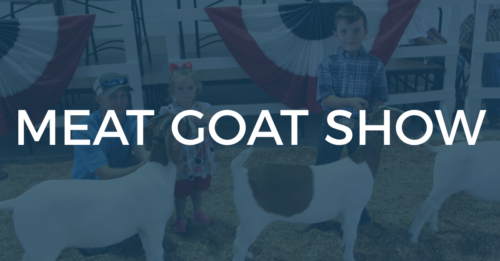 Special Note: Federal law requires that all goats that are exhibited in shows must meet USDA regulations and have a scrapie ID ear tag permanently attached in its ear or other approved ID. Exhibitors may contact the USDA office at (615)781-5310 to order their tags. Animals without proper scrapie tags or approved ID and certificate of veterinary inspection will not be allowed to exhibit. Please include check or money order for entry fee. Make checks payable to Smith County Fair. A separate entry form must be filled out for each exhibitor. All goats have to be shown by the exhibitor that it is singed up under. For more information, call (615) 633-6963.